In the early days of adapting to the FFcP exercises, a huge benefit is the bite size nature of the one octave patterns. 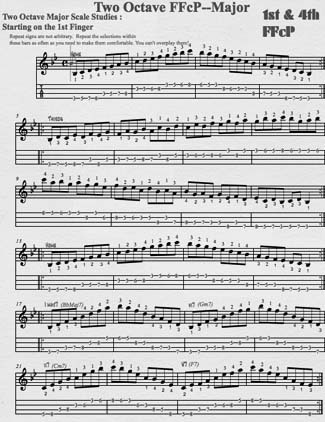 You have all seven tones of the scale, and we work consecutive steps, 3rds, 4ths, arpeggiated 7th chords, and contrary motion, putting them into your fingers and freeboard. You learn them like you learn words. Later they become part of a larger whole of musical sentences. If you do them enough (and properly), they become intuitive, and you don't really think them. They're just there. One of the next steps is advancing them into multiple octaves. We demonstrate the way to do this in our "Moving on Up" exercise, but you can also get facility across the strings by stacking the 1st FFcP with the 4th FFcP pattern. You've probably already done this with the scale itself; why not do it with the other components of the FFcP drills? We've taken this leap in yet another installment of advanced FFcP with a new two page exercise. We move you up the fretboard starting with your first finger on the Bb on the lowest string, and do two octaves without having to move up the neck. It's perpendicular rather than lateral. 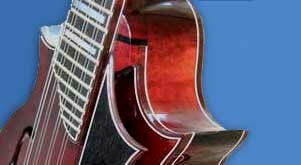 Note we can't do the same with stacking on top of the 2nd FFcP because we run out of strings on a 4-string instrument. 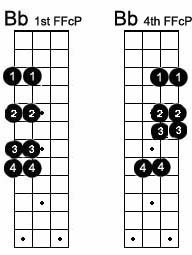 Of course if you have a 5- or 10-string instrument, you can get clever and start playing this the same way and move it on to a higher string. We'll save that for you champions of the five course to work out. "The notes seem to come from out of nowhere." Moving on up. And around.